Which Exposure Mode should you set? Modern digital SLR cameras are amazing things - they have so many options for just about everything that it can all be a bit confusing. OK the instruction book has 120 pages and there’s a Full Guide on a CD which runs to 700 pages, but in simple language which should you set? Set Auto or P and the camera will set the shutter speed and aperture, depending on the lens fitted. With some cameras it will even set the ISO and automatically raise and fire the flash if needed. Pros: Usually fine for snaps or holiday photographs in good light. Cons: Although the camera will usually display what settings it's chosen in the viewfinder, and some do allow “program shift”, you've just turned your very expensive DSLR into a compact. If you think this way will produce the amazing pictures you want – sorry it just won't. Just as it says, the shutter speed you set gets priority and the camera will adjust the aperture to get the correct exposure. Shutter Priority is my choice most of the time if I use auto exposure. Most unsharp pictures are caused by camera shake, so, unless you use a tripod all the time, Shutter Priority is the way to go. With a normal zoom lens I would set about 1/250 or 1/500 second and 400 ISO, rising to 1/1000 with a tele zoom. In poor light, compensate by raising the ISO to 800 or 1600 to keep the shutter speed to at least 1/125 or better (1/250, 1/500 etc). If that's still not enough you really need to get your tripod or flashgun out. Pros: You'll get sharp pictures. Also, the camera will usually warn you if it can't get a correct exposure and you have to choose another shutter speed. (usually the aperture figure in the viewfinder will flash, and the camera may refuse to fire) With Tv you will KNOW when this happens and what the shutter speed is. If you're hand holding a camera you MUST KNOW what the shutter speed is. Cons: You're still relying on the camera to get the exposure right – so watch the histograms. This time, whatever aperture you set, the camera will adjust the shutter speed to get what it thinks is the correct exposure. Great when you use a tripod. Excellent if all your pictures are landscapes and you use a tripod all the time – otherwise be very careful. Cameras today have a huge range of shutter speeds – often from 1/8000 sec up to 30 seconds, so you can probably set f8 at 400 ISO and take pictures in any light with this. The camera will be quite happy, no flashing lights or warnings. The only problem is that, unless you were carefully watching what shutter speed it set, many of them will be unsharp. Unless your camera is on a tripod, you MUST know what shutter speed it's using. Anything below 1/125 will probably have camera shake. If you've taken a whole set of unsharp pictures with a really good camera, this is probably why. Pros: Great for still life or landscapes with the camera on a tripod. Cons: Very easy to take dozens of pictures at 1/30 sec at f11 without realising it and then find none of them are sharp. TRIPOD USERS ONLY. Now, you may wonder why you would ever need this. The answer comes down to how serious you are about photography. If you use auto exposure of any sort the camera will get it right about 90% of the time if you shoot average subjects. However, when you try to shoot interesting or unusual pictures with striking lighting, auto will get it wrong most of the time. Which sort of pictures do you want to take? Understanding shutter speeds and apertures is fundamental to raising your photography above the snapshot level, so don't be afraid to set M.
Set your shutter at 1/250 or 1/500 if you're not using a tripod, and use the scale in the viewfinder to adjust the aperture until the pointer / dot is in the middle. Point the camera at an average, mid tone area of the picture when you're doing this. Then recompose, take the picture and check the histogram on the screen. Adjust the exposure until you get what you want. If you're on a tripod, set the aperture to f8 or f11 and then adjust the shutter speed to get the exposure you want. If it's a really unusual picture, you may need to use manual focus too !! 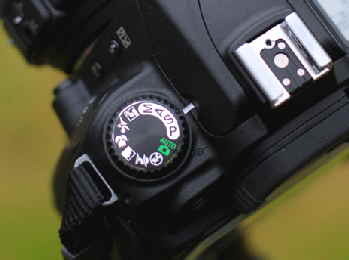 Many cameras have lots of little pictures around the exposure mode dial now. They'll usually include a portrait, sport and landscape setting and are intended to set the camera quickly to the settings an experienced photographer would choose for each type of subject. The problem is that, using these, means you'll never be an experienced photographer yourself.